Las Vegas has a breathtaking offering of shows for its visitors to see. While some of them contain explicitly adult content, many are family friendly. Some are even free, like the Masquerade in the Sky! One of the most obvious options when entertaining kids is a magic show. There are several excellent magicians in Las Vegas. Danny Gans calls the Mirage his home, and Lance Burton performs in the Monte Carlo. David Copperfield is based out of the MGM Grand, and Mac King is based out of Harrah's. Then there is Xtreme Magic at the Tropicana. These performers perform at different venues, they share one important characteristic: a commitment to excellence. A number of Las Vegas variety shows with also entertain both children and adults. Clint Holmes and V-The Ultimate Variety Show are two excellent options. Another very unusual option is the Comedy Pet Theater. Only in Las Vegas would a comedy show featuring our four legged friends (and birds are well). For musically inclined families, Legends in Concert, King in Concert or the Blue Man group will get your adrenaline going. The first two are shows performed by celebrity look-alikes, while the Blue Man Group is a unique percussion performance. Cirque du Soleil even has several offerings that lack the adult overtones of many Las Vegas shows. In fact, outside of Zumanity, most of their shows are a delight for all ages. 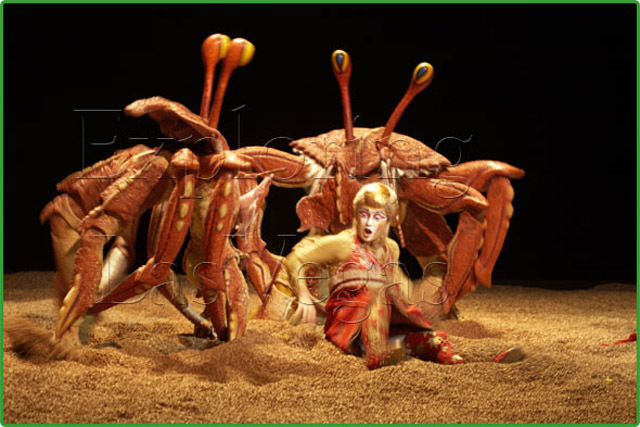 If you're interested in the strange circus called Cirque du Soleil, you should check out Mystere, KA and O. Depending on your children's ages and personalities, some of these options may not be right for your family. Magic shows with plenty of surprises and unbelievable acts could capture the attention of younger kids, while the obscure artistry of Cirque du Soleil might engage older children and teenagers.